I am a candidate (again) for election to the USCF Executive Board. The campaign has just started and no clear issues have emerged. I would like to start things with an opening statement. There are six candidates. These are Beatriz Marinello, Don Schultz, Mikel Petersen, Joe Wagner, Tim Hanke and myself. I know personally all but one of these candidates. I feel that all are good candidates and would do a good job if elected. I am not saying this as a matter of puffery. I really believe it. All of them are active tournament chess players ranging from Class A in strength up to master. All of them have a long history of devotion to and interest in chess related causes. I feel that the voters cannot go wrong no matter whom they choose. This has not always been the case in past elections. In past elections, there were candidates who had not played a game of chess in years or had never played chess at all. There were front men. There were hit men. There were secret slates with hidden agendas. There were anonymous letters from fake addresses, making the most vile and vicious accusations imaginable. In order to become elected, one had to be a member of a political group or slate. True independents had no chance. The laws of chess politics were: Any friend of my enemy is my enemy too. Any enemy of my friend is my enemy too. Any enemy of my enemy is my friend. The electorate finally became so disgusted with this that they threw them all out by instituting the One-Member-One-Vote System, now known as OMOV. The current election is the first election under OMOV. We can already see one improvement: All of the current candidates are chess players and none of them are a member of any known political clique or group. One problem I see, however, is that we do not yet know what the current candidates stand for, or what they plan to do if elected. So far, there are no big issues in this election. There is however one major new development. That is the announcement that the USCF Headquarters is moving from New Windsor, New York to Palm Beach Gardens, Florida. I am in favor of this move. New Windsor, New York is a terrible location. Costs are high. Transportation is difficult. There are only two busses per day from New York City to New Windsor and no trains. If you want to travel to New Windsor, you had best rent a car, as it is difficult to get there any other way. New Windsor was chosen because a previous Executive Director lived near there. That was a mistake. 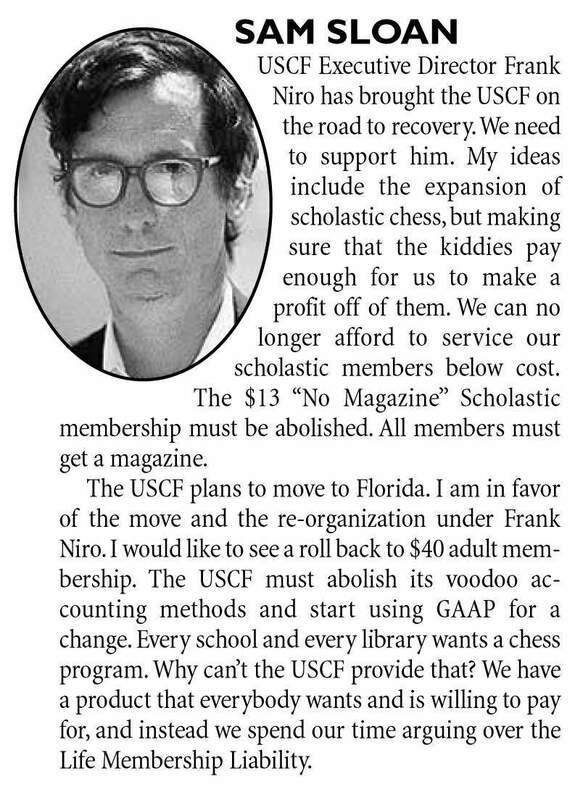 At the 2002 USCF Delegate's meeting in Cherry Hill, New Jersey, Frank Niro, USCF Executive Director, made a strong presentation as to the reasons why a move was necessary. Frank Niro pointed out that the USCF had lost money for six years in a row. Although these losses may have been to some extent the result of bad management, Niro felt that these losses were also caused by the structure of the building and the organization of the office. Niro felt that these losses were endemic in the way the office was set up and that the only way to make the USCF profitable was to gut the whole thing and start over again. I think that Frank Niro is right. The USCF has had six Executive Directors in the last seven years. Not all of them could have been bad. Fundamental re-structuring is in order. I have complete confidence in Frank Niro. I feel that he is the best man to do this job. I am not expressing any opinion as to whether Palm Beach Gardens, Florida is the best place. I agree with the idea of moving. I express no opinion as to where. I am strongly opposed to the original Doyle idea of moving into the World Chess Hall of Fame, which is also the headquarters of Excaliber, which manufactures computer chess products marketed by the USCF. The original plan was that Excaliber would become the landlord for the USCF. This is objectionable. It is unacceptable for a company that manufactures products sold by the USCF also to be the landlord of the USCF. Transactions between the USCF and Excaliber should be at arms-length. Few USCF members are aware that in early 2002 Bobby Fischer was expelled from the USCF. The reason that almost nobody knows about this is that it was not reported in the minutes of the meetings of the USCF Executive Board or in Chess Life. Bobby Fischer was expelled through the "Objections Procedure". This means that if no board member objects, it is done. This went through without several board members even knowing that this had happened. The Delegate's Meetings in Cherry Hill came and went without the delegates even knowing about this. If I am elected I will demand in the loudest terms imaginable that Bobby Fischer be re-instated as a member of the USCF. I am confident that I will be successful in this, because the expulsion of Bobby Fischer is one of the most outrageous things that the USCF has ever done. The current USCF Executive Board is the most secretive board the USCF has ever had. No information comes out of this board AT ALL. Even some members of the board complain that they cannot get any information about what the board is doing. We the delegates who attended the meetings at Cherry Hill were bamboozled into adopting a resolution presented by the USCF President that in the future there would be no stenographic records made of the meetings of the USCF. This was introduced as a cost-saving measure. Now, however, we can see that the real purpose was to keep secret the foul deeds of the USCF Executive Board, such as expelling Bobby Fischer for example. If elected, I will demand that transcripts be made of all meetings and posted on the USCF website. The delegates at Cherry Hill made a big mistake by agreeing effectively to reduce scholastic dues from $13 to $12 and to eliminate the publication of School Mates magazine. I voted for this change, but only because it came down to no choice. The only alternative up for a vote was to keep the old ruinous dues structure in place. Those who attended the meetings Cherry Hill will remember that I, more than any other delegate, argued vehemently against the reduction of scholastic dues and against the no-magazine option. I believe that all USCF members should receive a magazine. At the next meeting, I will vote to eliminate the no-magazine option. The major development in the USCF is that in recent years the organization has changed from an almost entirely adult organization to one where the majority of dues paying members are children. We have been providing USCF memberships to these children at a loss. The bottom was reached when scholastic dues were reduced to $7 per year, plus the kids got six issues of School Mates magazine per year. This was insane. No wonder the USCF lost money every year! Now that we have 45,000 scholastic members with that number increasing every day, we can no longer consider scholastic membership to be a loss leader. We cannot continue with the strategy of trying to rook these kids into playing chess by offering them memberships at a loss. Our first duty as an organization is to survive and we cannot survive by offering our largest membership group a membership at a loss. We need to try to make some money off the little darlings. Those with good memories will remember how the USCF was taken over by a gang which became known as the "Redman Gang". The Redman Gang is out of power now, but would like to come back. Three old gang members in Northern California have organized a scholastic tournament which, according to their advertisements, will have 1500 players and will be USCF rated but USCF membership will not be required. This is illegal under the USCF by-laws for several reasons. If I am elected, I will vote to suspend the membership of the organizers of that event until they pay for the USCF membership of every player in that tournament. I am hereby putting them on notice of this before the tournament is held. It is noteworthy that one of the organizers of this nefarious plot himself wrote the USCF By-laws. Therefore, he knows that to hold a USCF rated tournament without requiring USCF membership is a violation of the by-laws. He is doing this anyway, because he is out of power now, is vindictive and wants to destroy the USCF. The following actions should be taken if the organizers carry through their threat to hold the event as a USCF rated tournament where USCF membership is not required: The certification as a tournament of the organizers and directors should be suspended, their USCF membership should be suspended, the Northern California Chess Association should be de-certified as the USCF State Affiliate and, to fill the gap, the Southern California Chess Association should be once again recognized as the state affiliate for the entire state of California. I have run for USCF office before. My campaign statements from those elections are still on my website. You may find it interesting to go back and read them. You will find that I have often correctly predicted the future. For example, in the 1996 election campaign, I proposed that the USCF financial statements be prepared in accordance with Generally Accepted Accounting Principles. Many USCF members were shocked at my suggestion. Some claimed that they were already done in accordance with GAAP. They were wrong. Back then, in the bad old days, the USCF Financial Statements were prepared in accordance with the "Doyle Formula", the "4% vs. 6% rule", the LMA and the LML. None of this was done in accordance with Generally Accepted Accounting Principles. When Frank Niro became Executive Director in 2001, he quickly realized that the USCF books and records were a hodge-podge of mish-mash. The financial statements were completely unreliable as far as providing usable financial information. This is exactly what I have been saying all along. Frank Niro has training as an accountant and he immediately set about to redoing the financial records, so as to determine whether we are coming or going. This work is nearly complete. We all look forward to the results. One thing I have been thinking about is that some previous Executive Board members have been so thoroughly discredited that they will probably never come back. I cannot imagine that Eade, Dorsch, Doyle or Redman will ever be elected again to any position in the USCF. At the same time, most of the group currently in office will probably not run for re-election. This would seem to mean that new voices will have to be heard. The current slate of candidates confirms my prediction. Three of the candidates have never run for USCF office before. At least two of the other three are not members of any clique or group. None of the Old Guard is running this time. This I feel is a good sign. Still, there can be no doubt that the old group dreams of re-gaining power some day. We just have to have long memories and try to prevent that from ever happening. One of my dreams and one reason why I keep running is to bring a World Chess Olympiad to the US. I have attended several Olympiads and they are marvelous events. I believe that a USCF Committee should be formed to search for and secure a site to hold an Olympiad and to search for funding. I believe that this is a do-able project if the effort is made. In my view, the strategy should be to have a site ready as a backup. If the designated Olympiad site becomes unable to host the Olympiad, as has happened in many years, then our back-up site will be made available. At the 2002 World Chess Olympiad in Bled, the US Team finished 41st. The US team had a similar result at the 2000 Olympiad in Istanbul. This however was not the fault of the players. It was the fault of the Executive Board. The average age of the players on the US team was 47. They were soundly defeated by a team from Azerbaijan with an average age of 17. I have been complaining for years that young developing players who have immigrated to the US from other countries are not allowed to play in the US Championship, unless they have resided in the US for three years. Three years is too long to wait for a young, rapidly improving player. The USCF rules exempt players under the age of 21 who are "full time students". However, it is unreasonable to expect a grandmasters at chess to be a full time student. Three players who had otherwise qualified to the US Championship were not allowed to play because they were not "full time students". The most recent instance of this was Varuzhan Akobian, age 17, who qualified to the US Championship by winning the World Open, only to be told that he was not allowed to play in the US Championship because he was not a "full time student". Due in part to my yelling and screaming about this, he was finally allowed to play as part of a compromise. The result was that he was tied for first going into the last round. He had the advantage in the final game for the US Championship, but lost to Grandmaster Shabalov. Had he won that game, Akobian would have been US Champion. At the same time, it must be remembered that two other young players were not allowed to play in the US Championship only because they were not "full time students". If elected, I will push to have the requirement of being a full time student eliminated. Note that I presented this as a motion at the USCF Delegate's meeting in Cherry Hill. The delegates voted to refer this question to the Executive Board, but the Executive Board has refused to take any action on it or even to consider the matter. If I am elected, they will consider it.